mon 2 – 6 p.m.
tue – fri 10 – 12 a.m. / 2 – 6 p.m.
sat 10 – 12 a.m.
tue 10 – 12 a.m.
AGAIN in 2019: every first sunday each month 2 p.m. – 6 p.m.
Good Friday 19th April closed in the afternoon! These are e.g. 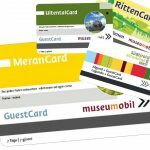 the MeranCard, or the AlgundCard, RittenCard or UltentalCard, just to name a few of the Tourist Cards that hotels provide their guests with. Besides the free use of buses and trains the hotels aquire with the Card also the entrance to our museum, so that by simply scanning the Card you can enter for free without paying anything extra.